Premium Bandai recently released the product information for the previously announced DX GabugabuRivolver and GabuGaburiCalibur set. Currently available for pre-order, the DX GabugabuRivolver & GabuGaburiCalibur are the toy versions of the transformation device and main sword weapon used by the Kyoryugers in the Korean sequel of Zyuden Sentai Kyoryuger, Zyuden Sentai Kyoryuger Brave. The set includes the DX GabugabuRivolver and GabuGaburiCalibur as well as a Cannontyra Zyudenchi and Zyudenchis 24-29. The DX GabugabuRivolver will also contain around 70 newly recorded sounds by Shigeru Chiba, series narrator and voice of the Kyoryuger’s arsenal. 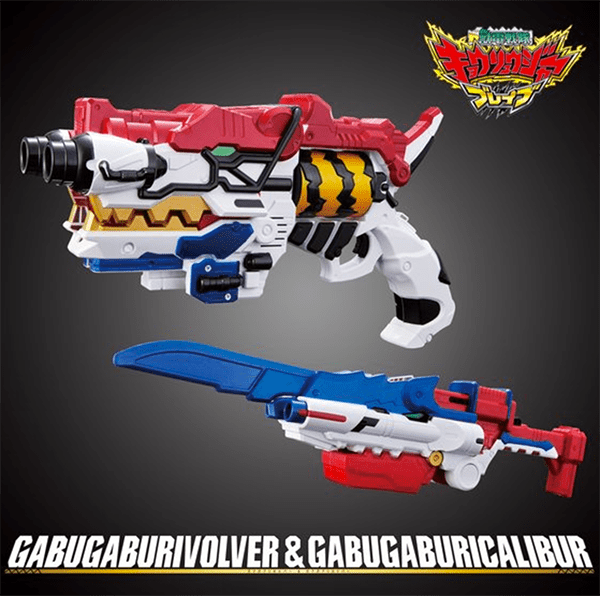 The DX GabugabuRivolver and GabuGaburiCalibur are available for 14,148 yen and pre-orders end July 31, 2017. The set is planned to ship in October 2017.